A two day pop-up show. 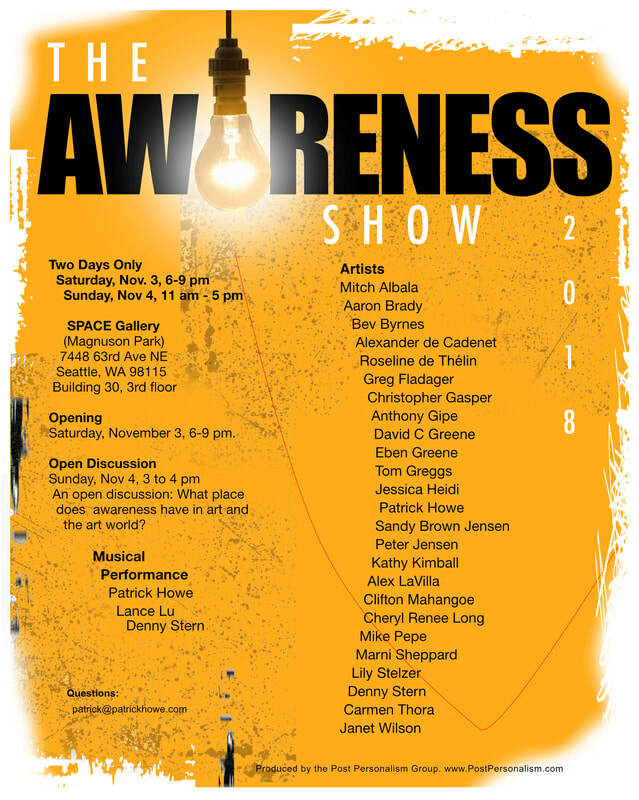 The Awareness Show will happen at Space Gallery, 7448 63rd Ave NE, Seattle, WA 98115, Building 30, third floor. Opening reception Saturday, November 3, from 6 to 9 pm. Music performance at 7:30 pm. Sunday from 11 am to 5 pm. The public is invited. On Sunday, November 4, from 3 to 4 pm there will be an open discussion at the gallery on the topic of awareness in the artist's work, and in the art world in general. The Awareness Show is produced by the Post Personalism Group.